I remember being a kid, loving Jem and the Holograms, Batman, and Barbie, and alternating between various themed lunchboxes to show my devotion to my favourite shows and characters, and being proud to display them. I even had a She-Ra sword that I’d beg to bring to school with me to show off to my classmates. As I got older, there became more emphasis on displaying brands like Nike and Adidas, and less desire to wear ‘childish’ things. Thinking back on that transition, it now seems a bit strange (and a bit sad) that we choose to pay to brand ourselves rather than to at least show off something that we have a passion towards and to which we can relate. Luckily, there are some crafty folks who didn’t want to give up on those characters that inspired us as kids, but also wanted us to be able to incorporate it into our more mature (HA) persona. 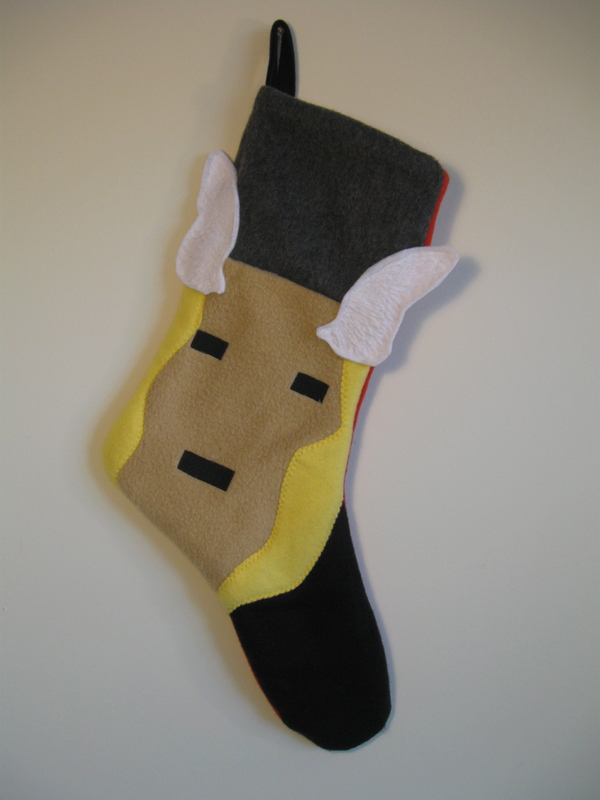 One such crafty folk is Gina, the artist, designer, seamstress, and brainchild of Super Sox. 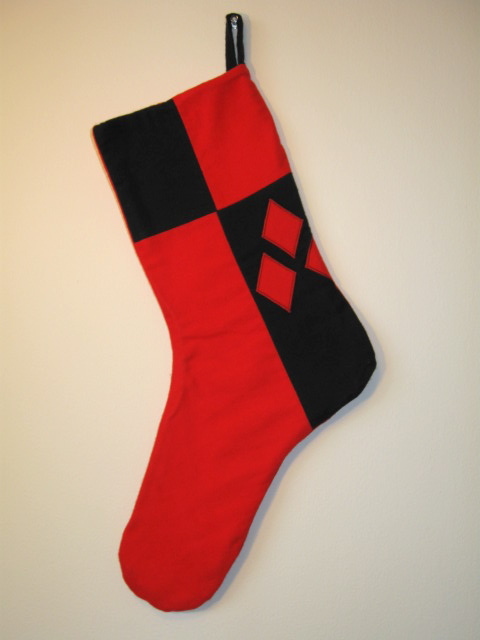 Super Sox is the accumulation of passion for well-made products, and the love of cartoons, comicbook characters, superheroes, and anything else that might dip a toe into either niche. Add to that the diversity of wearability and you get highly-accurate costumes and well-designed everyday pieces. You can choose to go full on amazing cosplay, or get a two-in-one with cool hoodies that allow you to go from sporty to Nightcrawler in the blink of an eye, just by putting the hood piece up! You don’t even need a phone booth! Theses pieces are detailed with care; you can really tell that Gina put a lot of thought and effort into creating accurate looks to appease herself as well as fellow fans! The gallery is filled with custom orders, including the aforementioned hoodies and costumes, kids costumes, and even theatre pieces. 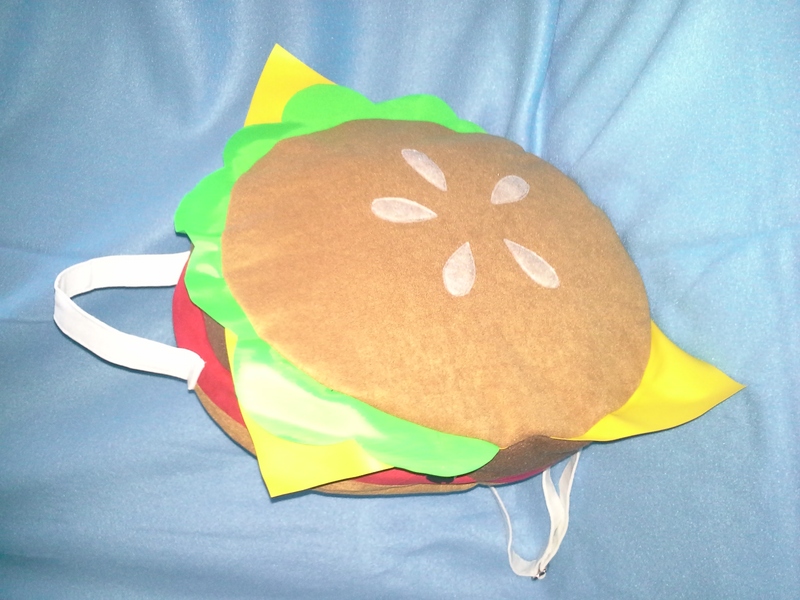 While Super Sox does a lot of custom work, they also have an online store featuring fun wearables, such as burger leggings (with an option to complete the look with a burger backpack), lemon hats, and, of course, a Link shield! There is also a wide range of sweet and adorable plushies that I just want to eat up! I think it’s obvious that the ultimate superhero would wear all of these at once. Of course, we can’t forget about the super ‘soxs’ that are the trademark and namesake of this crafty wonder-woman! From superheroes to supervillians, they’ve got every feet-ure covered. 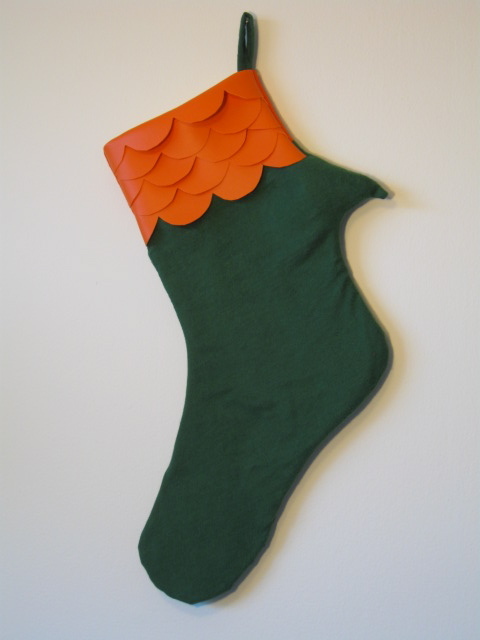 These fun and unique stockings are cool enough to leave up all year long! 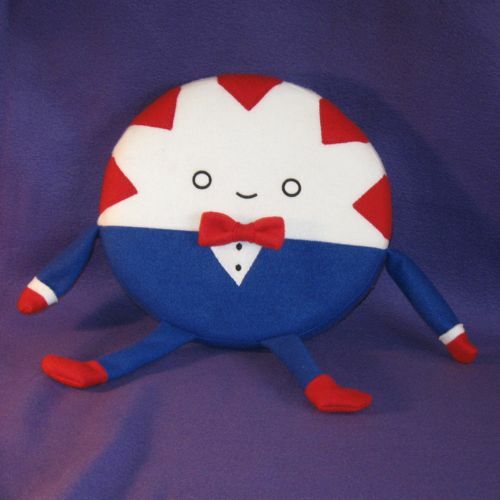 Although we can’t go back in time, to, like, totally 10 years ago when we were all kids, it’s nice to know that, thanks to crafters, artisans, and other imaginative people, we can once again experience the fun of exhibiting our cartoon allegiances in fun and new ways. Check out Super Sox’s website, facebook, blog, and store for updates, inspiration, and to feel like a kid again. Block 10 is the Witch Hat. 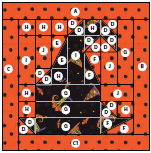 Here is the pattern for the Witch Hat Block 10. 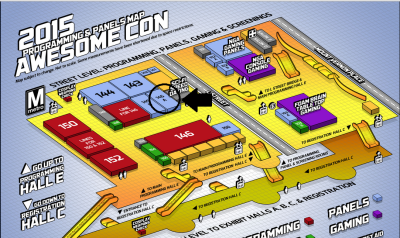 Today marks the start of AwesomeCon, a three day Pop Culture event in Washington, DC. I am excited to return to Awesome Con for the third year (this is also the third year it is in existence). 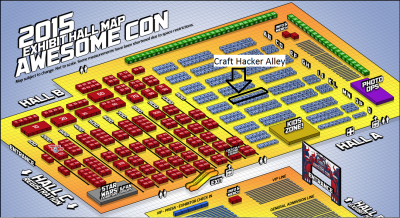 Nicole and I launched Craft Hackers at Awesome Con last year so it holds a huge place in our hearts. I am very excited to announce the Craft Hacker alley this year. The alley will feature some great Craft Hacker members including 3154Kelly, Team Kultzow, White Tree Chainmail, Ami Ami Creations, Quiltoni, Craftigurumi, and our special guest Colorworld Books. So take a stroll through our alley. Our members would love to chat with you about their crafts and art. I am also excited to announce that Craft Hackers is launching a Hang With channel today. Hang w/ is a site that allows us to stream live content to you. This content will get cleaned up and posted on You Tube at a later date, but it allows you see what we do at conventions as it happens! Nicole and I will start streaming today when we see anything interesting at the convention, see old friends, or meet new ones. We want to get all of the kinks worked out because tomorrow we will be streaming our Crafty Thinking panel live! For the first time you will be able to watch the Crafty Thinking panel as it happens even if you can’t make it to the convention. The panel will be taking place on Saturday at 10am in room 145a. It features Liz Reed from Cuddles and Rage and Rachel E Kelly from Colorworld Books. If you are at the convention, come to the panel with questions ready. If you can’t attend the convention make sure you sign up and follow us on Hang With. You will get a notification when we start streaming. I am not going to take questions through the app this time, but I may be able to for future conventions. I can’t wait for an Awesome weekend! See you there!! DIY – Repairs and fixing basically anything you need to! I’ve decided that it is a good idea to share some knowledge. A few years ago I attended a few seminars that were all about Z Day. Now listen, you zombie movie fans, this isn’t Zombie Day. This is a Zeitgeist Movement (I’ve included a link if you’d like to read about it) day where speakers share their knowledge. Regardless of what you think of the movement, there was a lot of really good information that I learned about in these seminars. One of the most fascinating segments was dedicated to a website called iFixit. iFixit is a website that is dedicated to uploading – and making accessible – repair manuals for almost everything that can be repaired. From IPhones to submarines, this website has it. The idea behind this website, and a main idea that echoes through the movement mentioned above, is that we can reduce our electronic and mechanical waste by having the ability to repair the things around us ourselves. It makes consuming a choice and not a necessity and it’s goal is to help change the way we think about the things that we own. The website’s goal is to help us “ditch the throwaway economy”. I personally must agree, we live in an economy of waste where we don’t wait for things to really wear out. We just want to replace whatever we own with the newest gadget. For those of you who have Iphones, how expensive is it to get one repaired once it’s past warranty? How many of you have had one break down outside of warranty? Well, here you can find ways to repair all Iphones, from first generation and onward. As you click through the guides, you will be electronically directed to the parts of the manual that you need, and there are often pictures to help you do the job properly and understand what you are looking at. There is also a list of things that you will need to make the repair, since you need the proper equipment for any job. Not just that, but they have an online shop where you can even buy the tools or parts that you might need for a particular project, since they might be hard to find or not readily available to the public. With so much tech going into the garbage, wouldn’t it be nice to just keep what we have working for longer? This website isn’t just for phones. It is for basically anything you can think of. An example that was given at the seminar I was at was this: There was a technician who had to repair a submarine because they were stranded, but no one was an engineer. They had access to the internet and were able to download the manual and instructions to do the repair that was needed to get them on their way. There’s also instructions on repairing clothing, from sewing buttons to doing more complex snap or strap repairs. You can even use this website to learn new skills from something simple like threading a sewing machine to soldering connections. The other thing that is really cool is that iFixit is always trying to add more user manuals so that it can keep its database up to date. It does this by accepting donations for items that it doesn’t yet have a manual for. 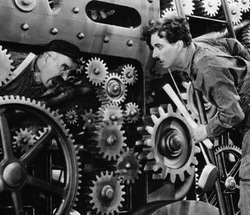 They have a skilled team of techs who will take the item apart, find out how it works, and post a new manual so that you can help others keep their things working for longer, help you save your money for the things that you need and help us as a society learn to be more conscious of how we consume. This is a great way to save your old devices, repair a radio, learn how to install a screen, fix your toaster or even fixing your game console controllers. This isn’t really an artistic DIY, but a very very practical one. I encourage all of you to take a visit and make use of the wonderful guides and tutorials that are offered. It’s a great way to do a lot of DIY repair projects that not only make your skills all that more useful, but it saves money, saves the environment and – I know this is the case for me – gives an enormous sense of accomplishment. Good luck and happy repairing! I’ve been doing some experimenting lately outside of my comfort zone- specifically, I’ve been making things that aren’t fabric based. This might not seem like a big deal for some, but I’m much more comfortable with creating something out of fabric and thread. But in my explorations of the cosplay world, there is only so much you can do before you need to deal with props and armor and other bits that need to be more solid. When you decide on a project for a costume, one of the first decisions you have to make is what materials will you use? The possibilities are endless, from fabric to foam, paper, metals, or plastics to name just a few. I decided to go the Worbla route and since it isn’t the most usual of materials, I thought there might be some of there out there who haven’t heard of it, but might find it useful. It works well and has a lot of lasting power. Worbla, or Worbla’s Finest Art to give it its full name, is a thermoplastic which basically means its a plastic that becomes pliable when its heated up. 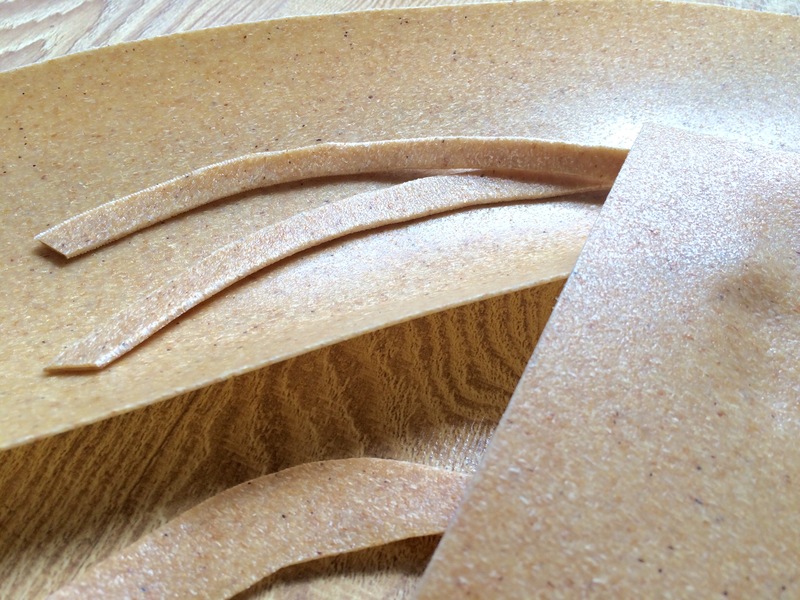 Worbla’s creators say it is made from renewable natural raw materials, which is something I like, and may be why it smells a little like bread when heated up. Heating it to sufficient pliability requires a heatgun, but once there it works almost like clay. It does get quite hot, so I wouldn’t do this with children who could easily burn their fingers, but for the most part, I had no issue with it. I’ve spent all weekend wrangling with a pair of shinguards, which were the most complicated Worbla project I’ve created to date. I do find that in going for a shape it is easier if I have something to base the Worbla on top of. For these shinguards, I used craft foam, although with Worbla’s pliability, it would certainly work for covering just about anything. The only difficulty with Worbla is that it isn’t as simple as just form it and paint it. Worbla has a grain to it, with bumps and and bits. Its part of the structure of the material that you can’t get away from. If that’s cool for what you’re creating, then of course its simple enough. But for most of what I use it for, I’m looking for a smooth surface. To that end, I have to spend time priming the Worbla to make it smooth. There are a number of ways of doing this, the two most popular that I’m aware of being wood glue and gesso. Either way, once done, you’ll find you have a solid piece that will take a good deal of abuse. Rather than trying to reinvent the wheel in explaining how to use Worbla, I thought I’d introduce you to Kamui Cosplay. My forays into Worbla crafting aren’t that impressive yet, but hers certainly are. 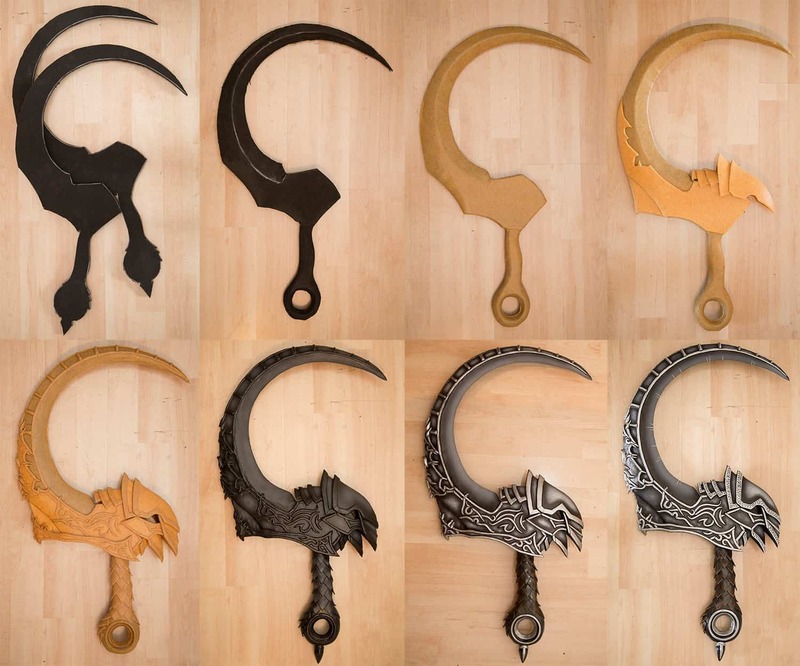 Scythes made by Kamui Cosplay out of foam & Worbla. Kamui Cosplay is, in my opinion, the most impressive Worbla using cosplayer out there. Her talent is jaw-dropping, but her gifts aren’t limited to the actual creation. She has actually gone ahead and created tutorials and books on how to use Worbla that include everything from patterning to finishing. If you’re not interested in the books on fabricating these items, she’s also provided video tutorials that show the whole process. Alongside Worbla, there is Worbla’s Deco Art which is a user friendly plastic that melts in hot water and becomes mouldable. There is also a new kid in town, called Worbla’s TranspArt, which is designed to be transparent. I haven’t had the chance to play with it yet, but it looks very interesting. The items you’ll need are Liquid Starch, Powered Alum, a thin wooden dowel/stick, a 9″ x 13″ aluminum baking pan, plain copy paper to fit inside the pan, and liquid acrylic paints in your choice of colors. Today I’m veering off into a different direction from my normal Sunday blog, so buckle up! Self-advertising is extremely important for any small business, especially a business of arts and crafts, as the products of such are not often items people necessarily need, like winter tires in Montreal, or water in California (poor guys). They are pieces of hard work and artistry that people want for their look, their quality, and for their uniqueness. Add that to the fact that people generally only see your items online and you have the perfect reason to invest your time (or money) into proper copywriting for your brand. Copywriting is the art of written salesmanship; it lets people know what they need to in a way that influences them to purchase or pay attention to your products. Though its’ roots are in ‘real world’ media, copywriting is an often overlooked but integral part of the online market. If done correctly, it will help your potential customers get to know you and the passion you have for your products, and will inspire them to appreciate your hard work and artistry as well. While a lot of people would opt for the ‘quick ‘n easy’ on the left, the writing and the font on the right are more likely to convince a person to purchase your product. A lot of artists would rather like to think that their products sell themselves, but realistically that is almost never the case. When you go to trade shows there is someone behind a booth smiling, inviting you over to check out their wares. They talk to you, they inform you, and you either walk away with an item or you walk away empty-handed. The same works for online: you must show your product, tell people what they need to know, and express to them why they would like it. Many artistic and ‘not-businessy’ people feel uncomfortable with this concept, but I believe that it is all a matter of perspective, so let us explore that. From your own perspective, you are making a product that you put a lot of effort into because you believe that the product is special, unique, something you’d want for yourself. It’s worth something to you, which gives it value, and chances are if you like it then other people will as well! Really, all you have to do is convey your passion and the personal value it holds in the product description. In other words, if people see that someone else values an item, the value of that item increases, and for good reason: that is how the economy works. Now let’s look at this from the customers’ point of view, which should be easy since we are all customers ourselves! When we go to a mall or a trade show and walk around we see thousands of items we’d love to have, all calling out to us: Buy meee BUY MEEEE! What is it that draws our attention and influences us to go over and evaluate something specific? It’s the setup of the items, it’s the display, it’s the sign with the company name. Once we have our eyes fixed, what is it that keeps us there, looking at the products and considering a purchase? Those very important aspects of selling aren’t what hold our attention: that is where informational brochures, business cards, and a friendly and helpful salesperson come in and take over to finalize the sale. Simply put, your website is your booth, your pictures are your display, and your copy is the person behind the booth being engaging, helpful, and showing that there is value in these products besides the materials used to make them. Remember, your entire brand is also a product to be sold, so use this idea when looking to market yourself! If you’d like more information on copywriting, check out Quicksprout’s detailed and incredibly helpful The Definitive Guide to Copywriting. As always, feel free to sign up with this blog and use the comment section to make suggestions or ask questions! Have you ever wanted to learn how to make molds and castings? Do you already make molds and castings and want to improve? I just learned that Smooth On has intensive two day seminars to learn the techniques and get hands on, direct teaching. As a crafter that has thought of mold making this was really exciting news to me. I have always thought about candle and soap making but have been scared to try to do it on my own. If I can find time to fit this into my schedule, it is something I am seriously considering. There is a downside though. Smooth On launched these classes at the beginning of the year so they are filling up fast. There are only two sets of dates still available, 10/30 & 11/01 and 11/11 & 11/12. All of the classes are at their Pennsylvania facility. So if you are interested, check out the information on their website. Do you make molds and castings already? I would love to see your work and get inspiration! Head over to the forums and show me what you can do. Today marks the first day of Anime North. Anime North is an anime convention located in Toronto, Canada that celebrates anime, manga, music, games and all other forms of Japanese Culture and Craft Hackers will be there! 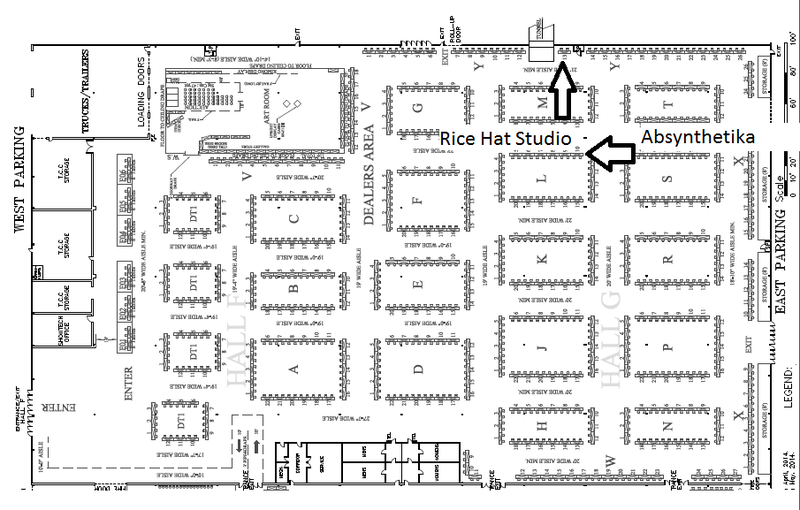 Absynthetika and Rice Hat Samurai Studio will both be in the dealer room at L10 and Y13. Geek @ <3 will be there as well in the artist area at PP07. So make sure you stop by and see them! If you didn’t plan on visiting Anime North and like all things Japanese then you should check it out. Hello Ladies and Gentlemen and fellow Crafthackers! As you know, Anime North in Toronto is coming up soon and I’m presenting another artist who will be attending it as a vendor this year (after a 4 or 5 year absence) – Retro G Couture. If you haven’t heard of Retro G, and don’t know the fabulous things that Georgie creates, then pay attention. Class is now in session. A taste of this year’s offerings. I have also personally known Georgie (as with Matthew in last week’s post) for quite some time and I have always been spreading the word of how wonderful her creations are. 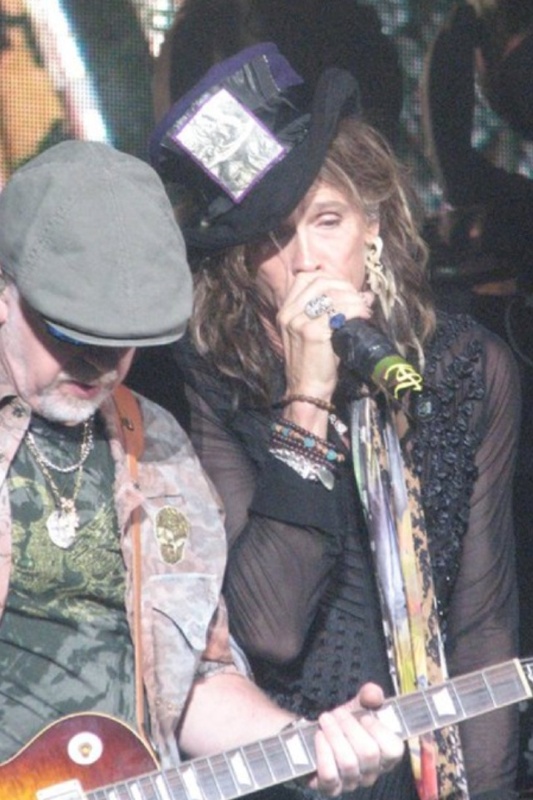 She designs and makes the most fabulous hats and jackets. 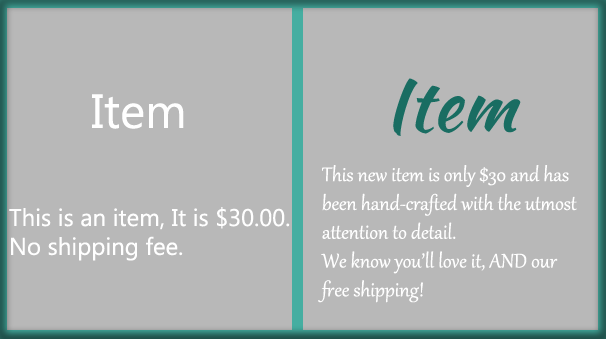 They’re fit for everyday wear since the quality is supurb and they are certainly one of a kind pieces. I even own a couple of these lovely works of art myself and they look almost brand new, though I bought them probably about 7 or 8 years ago now. 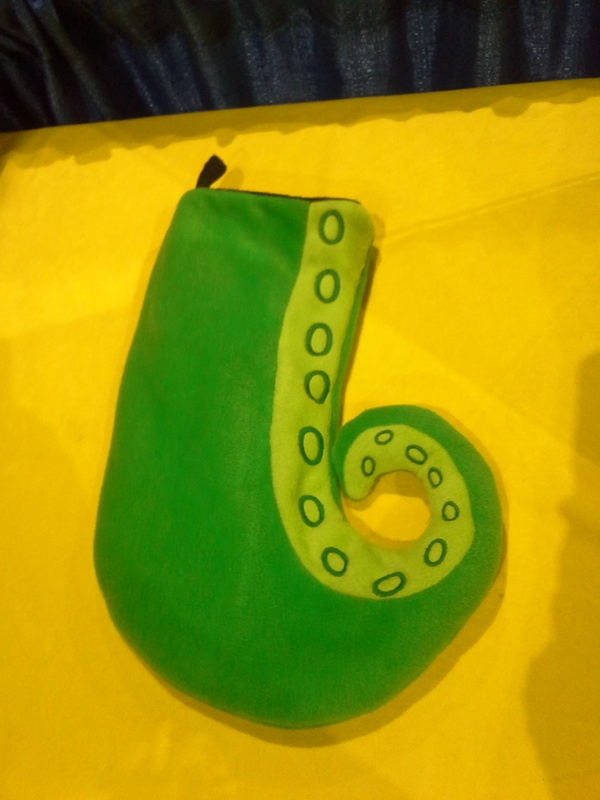 Retro G has been in different conventions and shows throughout the years. You can always find her at the One of a Kind Shows as well as the Canadian National Exhibition, but I’m happy to announce that she’s back at Anime North and she will be easy to recognize. Her creations are all reminiscent of carnivals and magic and of a time when people dressed to impress on the regular. Her garments are all fantastical creations that your eyes will just devour. When you go to her booth, don’t be intimidated by the outspoken garments you might see. Just wander on in and you’ll meet Georgie (and if you’re really lucky, you might also meet Stevie) who is so chock full of charm that you won’t even notice when she puts a hat on your head and a jacket around your shoulders. Be careful though, before you know it, you may be in love and go home with something new and spectacular! What I think is one of the coolest thing that Retro G does is that Georgie designs very distinct lines over the years. One year was themed around playing cards, another around Alice in Wonderland, others in stars and this year you’ll find something else that’s new and exciting. This always leaves you wanting more, and keeps you coming back for her different styles. You can contact her on her website and connect with her own blog as well as finding out what shows she will be doing throughout the year. Oh, and don’t forget, she doesn’t do clothing for just women. She has a men’s line as well (though it could be argued that the hats can go in either direction pretty easily. If you’re like me and have fairly broad shoulders for a lady, you can find some very lovely and flattering men’s jackets too. The biggest difference between the two is sometimes the broadness in the shoulders and sometimes the amount of lace. This is yet another thing that I love about these designs. 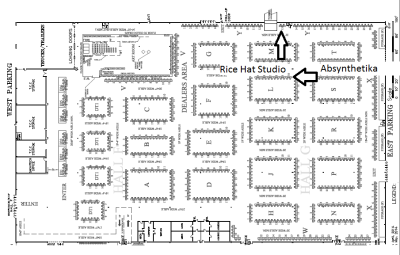 Drop on by to see Georgie along with all the other lovely vendors that are selling in the Dealer’s room. We are going to have some marvelous finds!